Being home in Texas means three things for certain: there will always be someone cooling off in the swimming pool, my daddy’s favorite playlist (self-titled Eggman) will always be on the outdoor speakers, and we’ll always be grubbing on the screened-in porch. 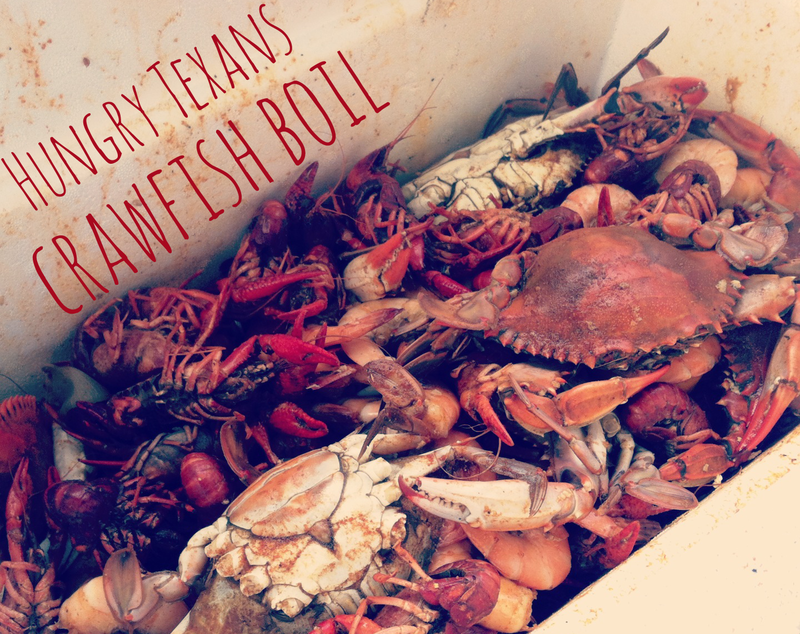 One of my favorite such grubs happens to be when we pull out the 80 quart pot, fill it with fresh seafood, and enjoy a good old-fashioned crawfish boil. 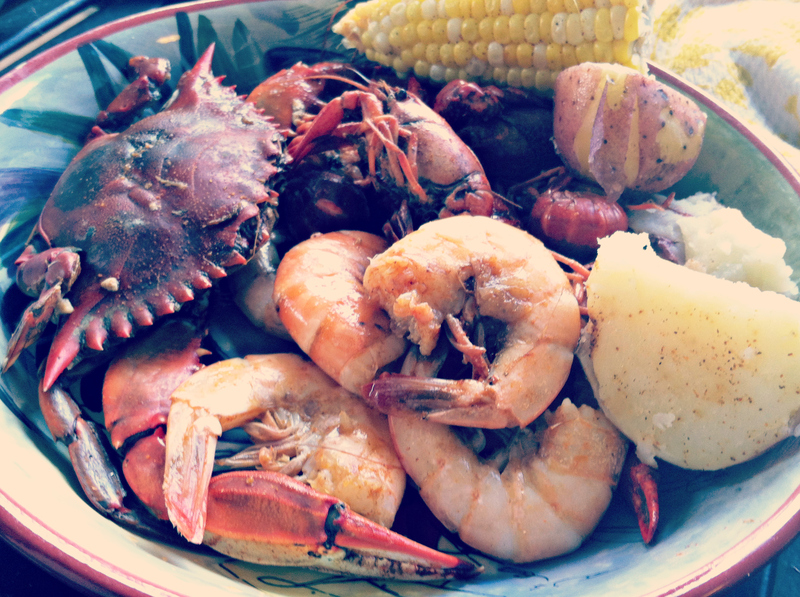 Blue crabs, Gulf shrimp, Louisiana Crawfish- all perfectly seasoned and served with sweet corn and potatoes to soak up the spice. There’s really no better way to spend a Sunday afternoon with family and friends than over a steaming bowl of shelled crustaceans. This is a pot of deliciousness that I’ll probably leave up to my dad, who humbly claims that there’s no secret to it, but has obviously mastered the art. 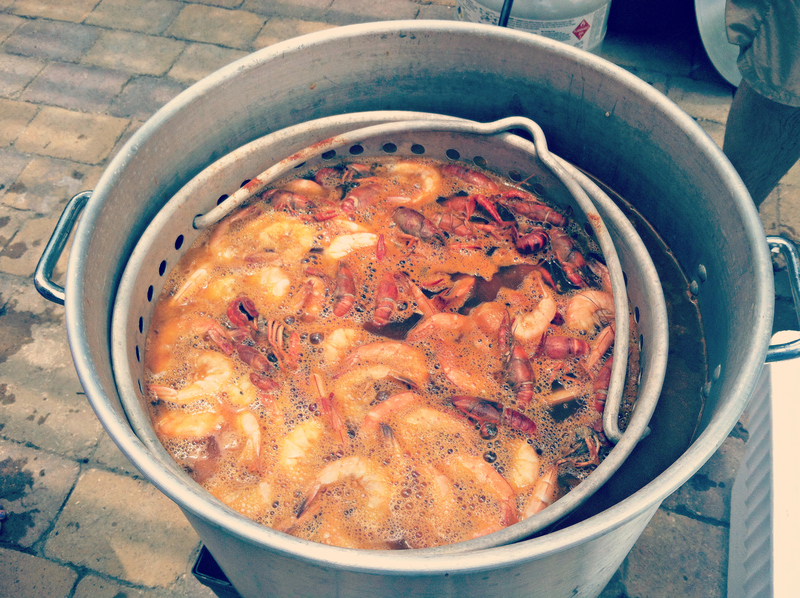 Still, it struck me as so simple, that anyone at home with access to a few mudbugs could recreate this Cajun delight. We made our way to the Vietnamese Fish Market for our supplies. This bustling Bissonet mainstay houses hundreds of Vietnamese staples and has a spread of fresh (usually still swimming) fish and seafood. For larger Crawfish Boils with the extended family when we need huge quantities of crawfish, my dad will venture out to Beaumont (about 45 minutes from Houston) for a surplus batch. But to feed 6 people, you can manage with a more local supermarket- you’ll need 2.5 pounds of shrimp, 10 pounds of crawfish, and 6 crabs. Fill the crawfish pot 2/3 of the way with water and bring to a boil. Add your seasoning, lemons, and butter. Let the seasoned water come together for about 5 minutes, then carefully remove the inner basket. If your crawfish need to be purged, be sure to do so! 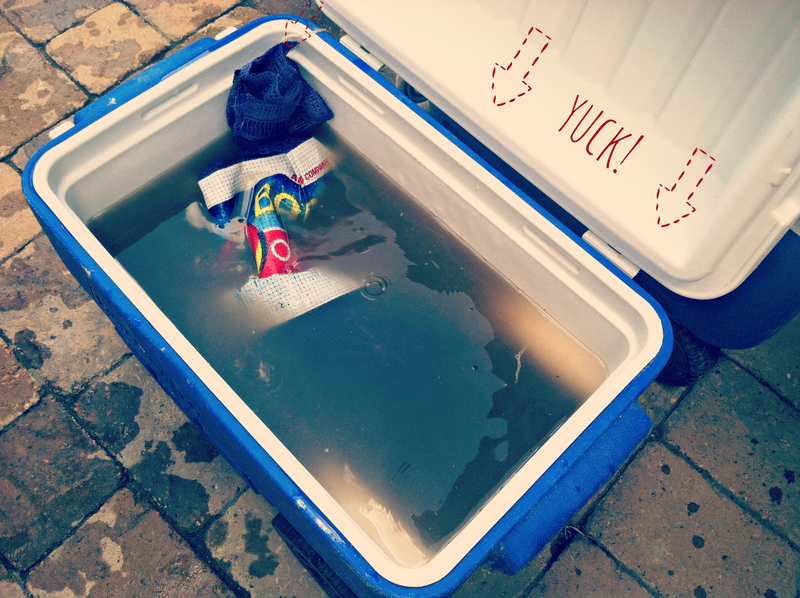 Fill a bucket (or cooler) with cold, very salty water, and add your un-purged crawfish. 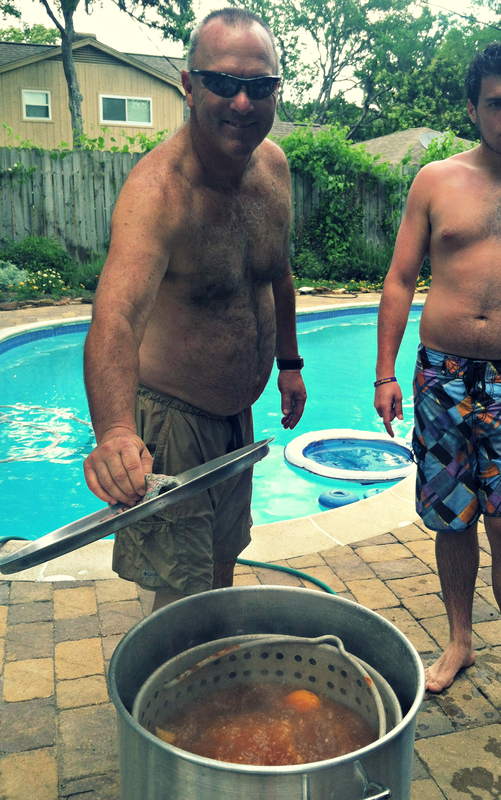 Let them sit in the purging water for about 10 minutes before tossing them in the pot. Fill the basket with your crawfish, crabs and shrimp. Carefully lower the basket of seafoody goodness into the pot, and cover. Let the pot boil for 7-10 minutes, then remove (enlist the help of 3-4 strong gentlemen) and pour your drained boil into a cooler. 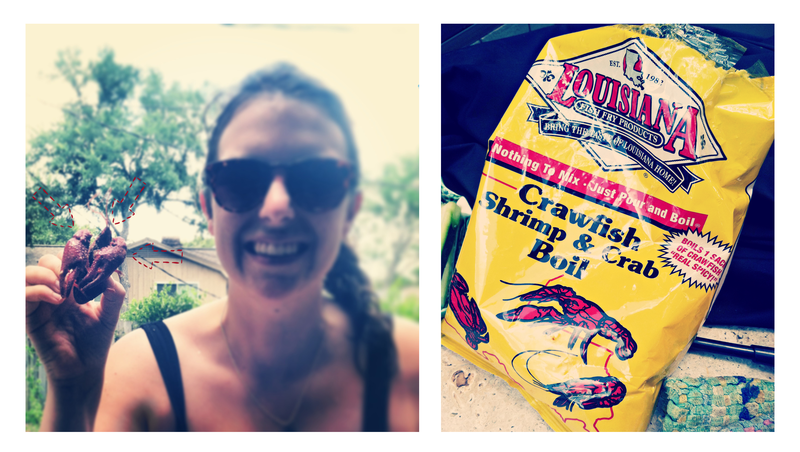 Toss the crawdads with as much seasoning as you like/can handle (we used ~1/4 cup) and laissez le bon temps rouler! You can pour ice over the seafood to cool it off before peeling. In a separate large pot of boiling, salted water, cook your potatoes and sweet corn ~30 minutes, until potatoes are fork tender. If you are brave, you can plop those potatoes and corn right in with the crawfish, but it will light you up, so take caution. Drain your potatoes and corn, toss with salt and pepper, and throw the whole mess out on a newspaper-covered table so that everyone can dig in. Or be a tad more civilized and serve the seafood in bowls. Just be sure to have plenty of wet napkins lying around to towel off, a few trashcans strewn about to make cleanup easy, and remember- never touch your eyes!